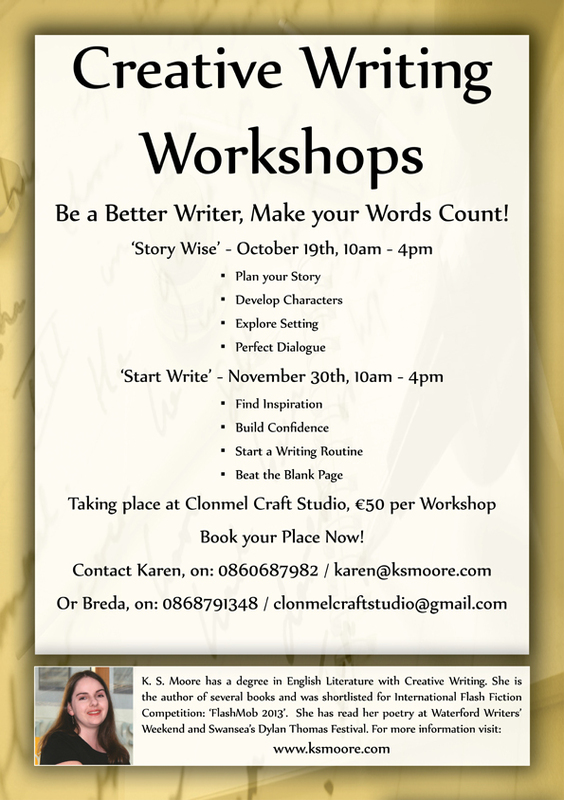 I just wanted to remind everyone that I will be leading two Creative Writing Workshops in Clonmel, over the next couple of months. ‘Story Wise’ will take place on Saturday, October 19th, and ‘Start Write’ will take place on Saturday, November 30th. Saturday, October 19th, 10am – 4pm. Learn to write a short story in a day with this innovative workshop, designed to help you find inspiration, develop characters, create realistic dialogue and plot with confidence. This very focused session would suit those who have some writing experience, and are looking to improve on the groundwork and overall impact of their story. We’ll look at setting, character development and story planning. Creating realistic dialogue will also be an intensive study area. By the end of the day, each participant will have a short story completed. Saturday, November 30th, 10am – 4pm. This workshop offers a general introduction to Creative Writing with lots of help in building confidence, finding inspiration and beating the blank page. It would be perfect for beginners or those who have done a little writing and would like to learn more about sustaining creative momentum, establishing a routine and believing in themselves. We’ll work on both short stories and poetry on the day. Short fiction can be great for developing good writing discipline. It’s also very satisfying, as a finished piece of work can be achieved in a limited amount of time. For more information or to book a place, please email: karen@ksmoore.com. Places are filling up on both workshops, so don’t leave it too late!